When the Amazon Echo appeared in 2014 it came as a surprise to most of the tech world - Amazon doesn't have the strongest of track records as far as hardware goes, and no one was sure just how much demand there was for a fancy Bluetooth speaker that talked back. Quite a lot, it turned out, and since then the original Echo has been joined by a few variations on the theme - including the Amazon Tap, which we're going to talk about here. We'll explain how it's different from the Echo and why you might one to pick one up. The Amazon Echo is where the story starts, in November 2014, putting a smart home assistant inside a glowing cylindrical speaker that looked vaguely futuristic. Pretty soon it became clear that it was the assistant - codename Alexa - that was the real star of the show, and Amazon finally got around to releasing more hardware with Alexa embedded in March of 2016: the Amazon Echo Dot and the Amazon Tap. The Dot does away with the big speaker but keeps the brains of the Echo, while the Tap (which we're focusing on here) keeps the speaker but removes the need for a power supply, relying instead on a battery pack. It's the Echo, gone portable. There's more to it than that, but those are the basics - the Tap is a portable Echo, while the Dot lets you use your own speakers or hi-fi system with Alexa. Amazon continues to sell all three, giving you a choice of ways of getting Amazon's smart assistant into your home. Meanwhile Alexa continues to make its way into more and more gadgets, even those not made by Amazon - we've seen it in phones, other speakers, and even cars, taking on similar apps from the likes of Apple and Google in a bid to be your go-to bot friend. The list of commands you can say to Alexa just keeps growing as Amazon and third-party developers alike continue to add new functions, so if you do buy something with the Assistant built in, it's likely it's capabilities will continue to expand over time. 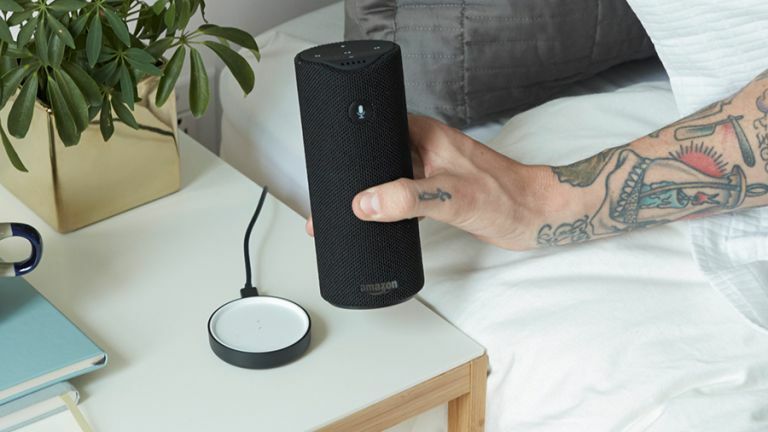 The Amazon Tap Bluetooth speaker - the portable Echo - measures 159 mm by 66 mm (6.3 inches by 2.6 inches), making it about two-thirds the height of its bigger brother. It weighs in at 470 grams (16.6 ounces). Of course Alexa is on board - your all-powerful digital assistant that can do everything from call you an Uber to read you the news. To do all this it needs the internet, either via a direct Wi-Fi connection or through the data connection on a connected phone, with the Alexa app installed. Originally there was one key distinction, besides the added portability, between the first Echo and the Tap - no always-on listening mode with the smaller speaker. That meant if you wanted to call on Alexa, you had to physically press a button to activate it. However, Amazon has since added an always-on mode to the Tap with a software update, so you can use it if you don't mind the battery hit. Speaking of batteries, Amazon says you should be good for about 9 hours of continuous music playback, which is a decent amount. Recharging is done over microUSB and a charger cradle and you can use the speaker while it's plugged in if you're not travelling. There are six colours to pick from, meanwhile: white, black, blue, green, magenta and tangerine. Unlike the Echo, the Tap has a 3.5mm auxiliary audio input jack, enabling you to plug in other sources if you don't want to connect via Bluetooth (another way of saving battery away from the house). Amazon Tap: should you buy one? If you're more interested in the first reason, you need to weigh up the Tap against the Echo and the Echo Dot, as well as any other Alexa-enabled devices that might be on sale in your part of the world. With its portability, cheaper price, and newly added always-listening mode, the tap is certainly very appealing when weighed against the first Echo. Speaking of price, the Amazon Tap will set you back $129.99 (about £105) straight from Amazon, which includes the charging cradle. Unfortunately it's not available in the UK at the time of writing. If the second reason is of more interest, the Bluetooth speaker part, then the Tap is up against dozens of similarly sized and specced speakers. You might be able to find something cheaper and more suited for your needs (the Tap isn't waterproof, for example), but of course the addition of Alexa probably makes the Tap better value. Whichever way you cut it, the Amazon Tap is a great value buy if you're in the market for either a speaker or an upgrade for your fledgling smart home. Meanwhile, if you're wondering whether you should dip your toes into the world of Alexa for the first time, we'd highly recommend it - whether playing music, setting timers, reading out the news, or solving trivia questions, Alexa is hugely versatile and getting better all the time.